This is the part 2 (and final part) of my Notorious series. Ugga Drop is a fairly simple game that you can easily master with a bit of practice. The 411 on Everything UC pets! 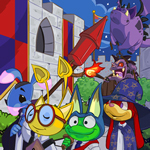 Every week, we are presented with a fresh new edition of The Neopian Times. It is an excellent compilation of many different articles, stories, comics, and more from the many great writers and artists from all over Neopia. While most Neopians have been battling the fierce cold this season, we thought it would be a great time to gather up a list of the best gourmet foods to not only fill your bellies, but also to warm you up on the coldest night. So, settle in while we present to you our picks for the very best Warm You Up Gourmet Party! In December 10th of 2010, Neopia have received a few news: Imposter Apple avatar was released, new Neocash items from the cards were available, a new chapter of the Faerie’s Ruins was launched... But the day after that, no one was expecting that: TNT released the brand new Holiday Dream Neopet Giveaway! Today marked the opening of the annual Winter Neolympcis! Here are some top tips for overcoming the frustrations you may encounter as you try and improve your status in Neopia. Every day around 3pm NST, 20 pirates chow down in Food Club and depending on who wins Neopets users can earn millions in a matter of minutes.